Some of you may be looking for a great deal for gifts and others are just in the market for some new clothes at the beginning of this new year. 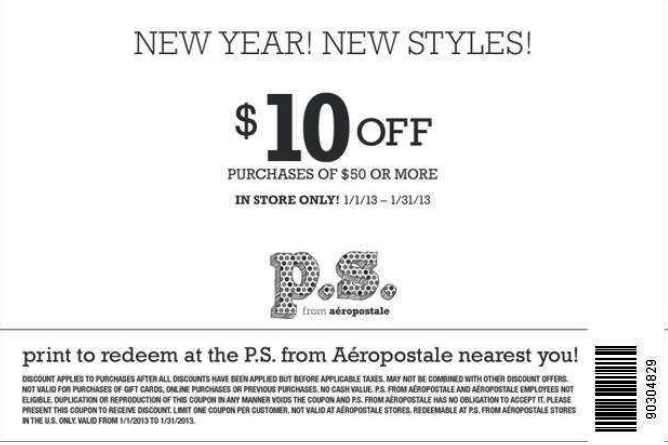 Either way, this is a decent Aeropostale coupon that can save you money to revamp your wardrobe a bit. Aeropostale clothes are usually one of the cheaper brands that you can buy too (cheap price, not cheap quality). That means, you’ll be able to get a lot of clothes for not much money. And you want to save even more money? Of course you do! The savings here are taken AFTER any other discount. Most other clothing coupons will only allow you to use the coupon for the deal and then that’s it. With this deal you can combine in store discounts with this coupon. Come back soon and we will have new coupons for you! !